Because, damn, it is cold, and it is time for soup. Soup & Bread at the Hideout starts January 2. We are changing things up a bit this season, and we’ll have more info soon on just how and why. If you’d like to sign up to cook, or just want to get on our email list, please shoot us a note at soupnbread10 [at] gmail [dot] com. But, wait, you say … January is two months away. What to do in the meantime? Lucky for you, we’ve cooked up some special events for November and December. On Wednesday, November 14, we’re thrilled to be partnering with the Garfield Park Conservatory Alliance to stage a very special Soup & Bread in the greenhouses of this West Side institution. We’ll have soups from West Town Tavern, Mana Food Bar, City Provisions, Inspiration Kitchens, and an array of other stellar contributors — each of them inspired by and showcasing ingredients found in the Conservatory. Are you ready for lime soup? What about plantains? Or chocolate? We’ll also have a special “hailstone soup” station highlighting the Conservatory’s ongoing roof reconstruction project in the wake of the 2011 storm that devastated the building, plus live Middle Eastern music and I don’t even know what all else. Come find out at 300 N. Central Park from 6 to 8 pm on the 14th; a $5 suggested donation benefits the Conservatory and the neighborhood group Breakthrough Urban Ministries. All ages! BYO teacup. Sunday, November 18, we’re helping the fine citizens of the West Walker neighborhood stage their very first Soup & Bread. We don’t have a lot of details yet, but it’ll be early Sunday evening at the Irving Park Lutheran Church gym at the corner of Harding and Belle Plaine. All proceeds benefit Three Brothers Garden and Carlson Community Services — and as soon as we know more, we’ll share, we promise. Saturday and Sunday, December 1 and 2, we lug our merch back to the halls of commerce, and take up our now-traditional spot in the hallway outside the second floor women’s restroom for the 7th-annual Renegade Craft Fair Holiday Market. We’ll be there all weekend, 11 am to 6 pm. We promise not to run out of stuff this year! 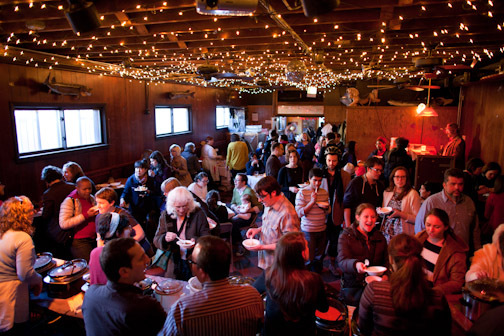 Last, but not least, we return home to the Hideout for Chicago’s coziest craft fair, the annual Hideout Holiday Sale, the two Tuesdays before Christmas, also known as December 11 and 18. The fair runs 6 to 9 pm, there’s no cover, and there is beer. And, sheesh. That’s it — until January 2, that is. See you soon! PS: I am the last person to doubt the power of soup, but even the canned Campbell’s stuff only goes so far. If you want to help with Hurrican Sandy disaster relief, don’t donate soup, give money!